A long time Q-nomy customer, the United States Department of Defense implements the Q‑Flow Customer Visit Optimization solution line for more than 10 years in a number of Military, Air Force and Navy medical centers. 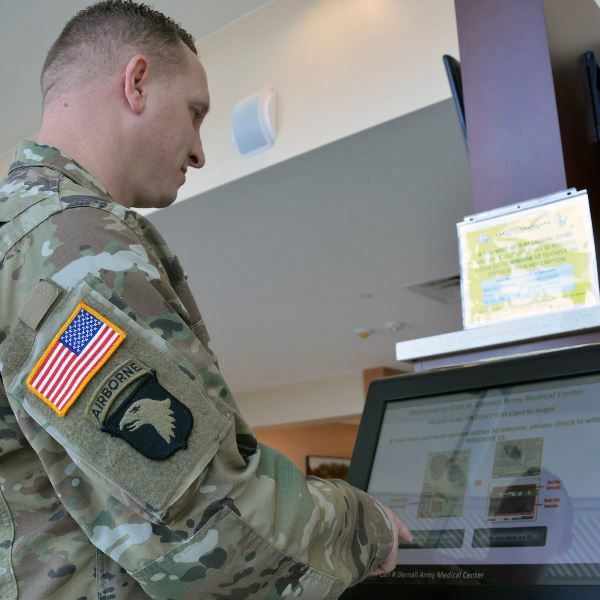 An article written by Erin Rogers and published in the Fort Hood Sentinel on June 2016 made it possible for us to share a bit of information on how Q-Flow is used to optimize patient flow and experience in a modern medical center. The $534 million, 1 million-square-foot Carl R. Darnall Army Medical Center (CRDAMC) in Fort Hood Texas, is a good case study that shows the immediate positive impact Q-Flow has on medical center performance. CRDAMC includes a 615,000-square-foot, 122-bed hospital; 322,000 square feet of outpatient clinics; a logistics building and a 23,000-square-foot central utility plant. The facility showcases numerous innovative sustainable and world-class features, including operational software solutions. Patient flow management system that would reduce waiting times, improve patient satisfaction and the overall performance. Cross-department patient visits had to be managed and supervised by a single solution to ensure SLA for the entire patient journey. Unified communication and information distribution system that ensures all patient orders, data, test and lab results are available to the right professional at the right time when the patient reaches their station. Self-service check in and routing that lets visitors skip waiting for a receptionist when they already know what they need. Q-nomy's partner ACF Technologies, an expert integrator of patient flow and experience solutions, together with CRDAMC staff, made it possible for Q-Flow to be up and running from day one of operations. The installation included a complete visit management solution with self-service kiosks, patient and visitor check in and routing, queue management, digital signage and medical case management systems. Utilizing and managing all these features from a single application helps CRDAMC to optimize the patient journey and throughput and improve the patient experience significantly. According to Thompson, Q-Flow made it possible to reduce patient journeys through different departments like clinics, labs, pharmacy, etc. by at least 45 minutes. Q-Flow reduces patient journeys through different departments by at least 45 minutes. Q-Flow increases staff efficiency by streamlining medical case management in multi-department patient journeys. Maj. Lyle Kolnik, deputy chief of pharmacy, demonstrates the Q-Flow automated ticketing machine that helps enhance the CRDAMC Patient Experience. Photo by Gloria Montgomery, CRDAMC Public Affairs.